Now you can see clearly what’s going on. How much damage you’re dealing, how much damage you’re receiving, if you’re getting healed etc. In my opinion damage numbers give player a valuable feedback about what’s going on. In the future update I’ll add an option so you will still be able to disable them if you find them bothering. 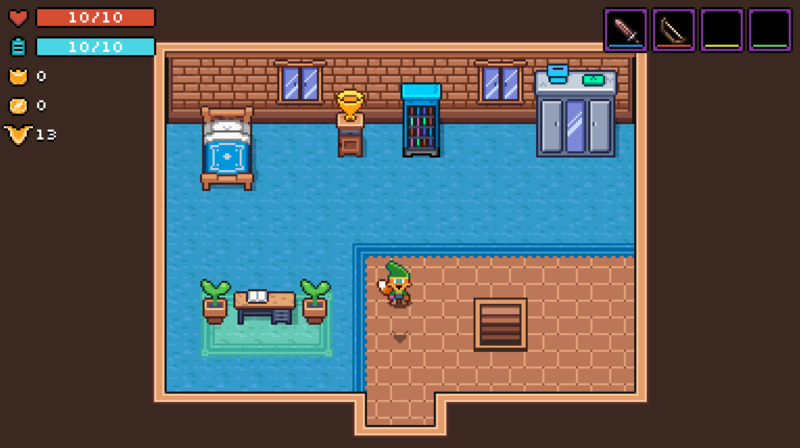 Besides all the special rooms that you can find in Reynard, I wanted to add another thing that would reward exploration. That’s why I’ve added Zoe. She’s a cool owl which can reward you with different items. You’ll be able to summon her only if you trigger all the pressure plates in the level. 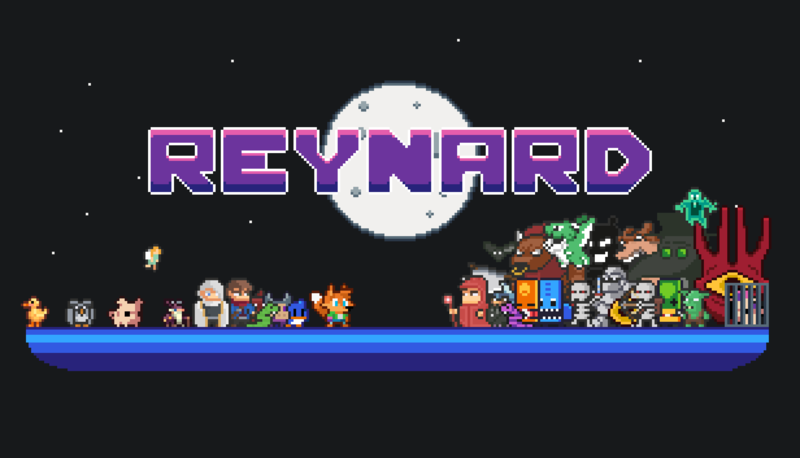 As the playerbase of Reynard is growing, I’m receiving more and more feedback. One of the fellow gamers told me that he had an issue with a resolution. He told me that he can’t normally see the whole cell of the dungeon. I had no other options left, but to tackle the camera again, which lead me to upgrade the whole unity project to the newer version etc. 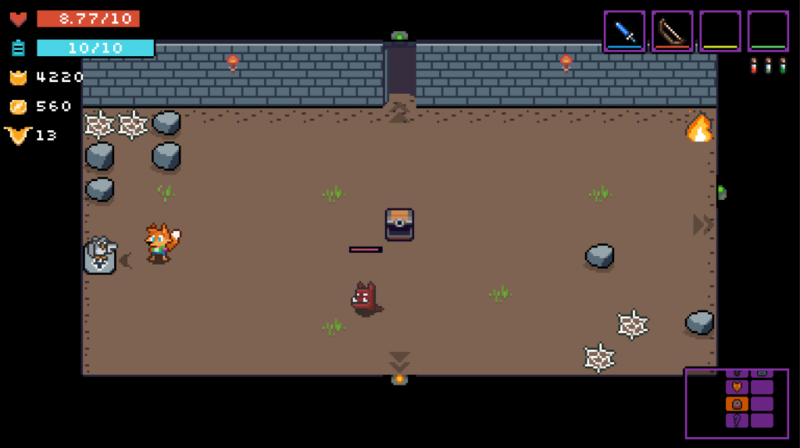 Now in dungeon all players have the same visible field. I solved this with leaving the game to the monitor’s native resolution and adding black bars to the screen. It works good and the game looks smoother than with an older camera settings! [HUGE] Camera rendering changed. The dungeons should now be normally visible on “unordinary” resolutions. [FEATURE] Added damage and healing numbers! [FEATURE] Added Zoe (an owl). [FEATURE] Reynard’s house has been redecorated! [SKIN] Those who will unlock the “pot hater” achievement will also unlock the “pot hater” skin! (Inpsired by the one and only – Link). [MINOR] UI is now being rendered clearer. [MINOR] Damage of “damage over time” effect now gets applied after a second and not instantly! [MINOR] Invasion now also spawns water. [MINOR] Added more invasion layouts. [BALANCING] Buffed the waves and subwaves of the invasion. [BALANCING] Nerfed the xeno turret’s attack rate. [BALANCING] Nerfed Sizzle’s damage and increased his attack rate. [BALANCING] Buffed Cobra’s attack rate. [BALANCING] Buffed fire spear’s fire duration. [BALANCING] Tweaked the generation of runes which deal damage over time. [BUGFIX] Fixed a lot of animator missing values. [BUGFIX] Removed wooden club’s damage over time. [BUGFIX] When moving up and left on keyboard Reynard was facing up. When moving up and right he was facing right. Now in both cases he faces up. [BUGFIX] Fixed the Judy’s arrow’s starting position. [BUGFIX] Fixed the Skeleton archer’s arrow’s starting position. [BUGFIX] Changed Thunder Sword’s sprite.